Sophie Bryant (right), Women’s Suffrage Procession c.1910. LSE Library/Flickr, No known copyright restrictions. She wrote on a wide range of topics. The vast bulk of her writing was on education, including moral education 4. She wrote on symbolic language and on the relationship of logic and mathematics, drawing on George Boole’s work. 5 Her papers on psychology cover such topics as emotions, sympathy and consciousness. However “Ireland was in the heart of her heart”6, and Bryant’s greatest achievement philosophically speaking was in “the innovative national inflection she gave to understandings of the relationship between self, philosophy and society”7. 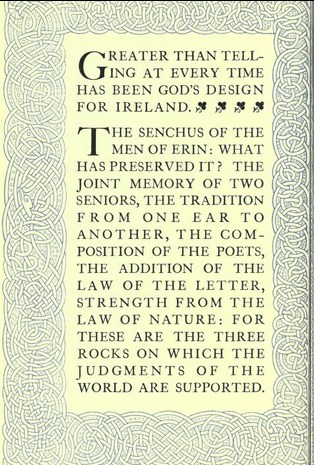 Her first book in the Irish Renaissance vein was Celtic Ireland (1889). This outlined Irish history, avoiding exaggerated claims of Irish importance, but showing that the Irish were not merely barbarians and successfully ruled themselves. It also contained Bryant’s first writing on Gaelic psychology (see quote re Eriugena here). Her thoughts were expanded into “one of the more original contributions to the cultural debates of the Irish Literary Revival”8: The Genius of the Gael: A Study in Celtic Psychology (1913). This book is of its time: Bryant starts by distinguishing between “racial units” and “composite nations”, races being formed from a “process of mixed hereditary and education” (education including common environment and culture)9. However, the nature of the traits she ascribes means that culture plays an important part in the story. Races can come together into a composite people, “a people not by unity of race, but by community of spirit”10. The Irish nation is, for Bryant, such a composite people, with a common “Irish touch, a liveliness of mind, individuality, a personal interest in other people, and courteous manners”11. And in the nation, “the Gaelic race it is – a branch of the Celt – which forms the nucleus”12. Drawing on her psychological studies of the self in the leading philosophical journal, Mind, and her theories of national sentiment published in Dublin University Review, Bryant argued that this characteristic [self-contradiction] of Irish people had to do with a steadfast refusal to engage in self-censorship, or to internalize social authority. The Irish person, said Bryant, “corrects himself, not by subpression, but by some new form of expression”14. Rather than inhibiting, the Irish personality needs to develop, requiring “a sphere of social life in which to express himself…[which] teaches him balance, correcting the emphasis he impresses on it by some other emphasis which it suggests”15, and the more rich the world, the more developed the personality becomes. Thus culture is important in the development of the Gael. As Gibbons argues, identity is therefore not a given and the whole description can be read, not as biology, but as the natural reaction of the colonised, who “have little choice but to fashion their identities in the presence of others”16. Bryant emphasises the “Celtic gift of accurate imaginative sympathy” 17, an consciousness of the other which Gibbons contrasts with sympathy as used in the Scottish Enlightenment, which, despite its acknowledgement of the other, also involved managing ones self-presentation towards the general norm, fixing and stabilising identity18. Bryant therefore is not necessarily conforming to existing stereotypes or “deferring towards the ideas and institutions of the past” 19. However note should also be taken of the political importance of the work. She looks to the Irish Renaissance to draw the people of Ireland together “divided as they are today by a political controversy”20. The power of the Gael to integrate incomers and the resulting shared social culture give a rationale to seeing the people of Ireland as one nation (in the tradition of Thomas Davis), even if they are not one race. Later chapters outline the Irish abilities socially, in politics and in the literary sphere, exploding any idea of Gaelic incompetence. A chapter on Irish law refutes the charge of primitiveness laid against the Brehon laws. has…been written throughout in the hope that it might prove to be of interest – perhaps even of service – to my countrymen and countrywomen in the work of social reorganisation which lies before them, and to which so many of them have already put their hand. It is sometimes claimed that the status of women in early Irish law was considerably more advanced than that in comparable medieval cultures. But that claim finds little, if any, factual support in the laws. Most legal rights were dependent on the ownership of property, and most property was owned by men. That said, this was a common trait in Ireland at the time (compare with Pearse’s theories of education in line with contemporary practise and justified with reference to the past.) Eoin O’Neill reviewed the book in 1924, and agrees with Bryant that women had a “remarkable” range of rights. He disagrees that Brehon Law is tribal, entirely customary, judicial authority is purely consensual, all judgements are assessments of damages and that the term céle refers to a tenant. He notes however that Bryant is concerned more with the spirit that underlies that underlies the provisions of Irish Law and with the effect of Irish law on education and character”, and concludes that “subject at least to the reservations that I have stated it is solidly instructive”22. Sophie Bryant was not just an intellectual woman, but one who loved physical freedom. As well as rowing and cycling, she loved to climb, reaching the summit of the Matterhorn twice. On holiday in Chamonix in August 1922, she went missing. Her body was found on 28th August. Her date of death is recorded as 14th August 192223 .
cropped (c) National Portrait Gallery (CC BY-NC-ND 3.0). Sophie Bryant (1897) “The Celtic Mind” in Contemporary Review, 72, p. 538. Thomas Duddy (2002) A History of Irish Thought, Abington: Routledge, p.288-9. Luke Gibbons (2004) “Bryant, Sophie (nee Willock: 1850-1922) in Thomas Duddy (ed) Dictionary of Irish Philosophers, Bristol Thoemmes, p. 44-46. Luke Gibbons (1996) “This Sympathetic Bond: Ossian, Celticism and Colonialism” in Terence Brown (ed) Celticism, AT: Rodopi, pp. 273-291. MacTutor History of Mathematics archive: Sophie Willock Bryant. Irish Democrat (newsletter of the Connolly Association): Sophie Bryant – Part 1, Part 2. Peter Tremayne, author of the Sister Fidelma Mysteries acknowledges the influence of Sophie Bryant – his outline of the life and work of Sophie Bryant. What did Sophie Bryant do for the history of stem?